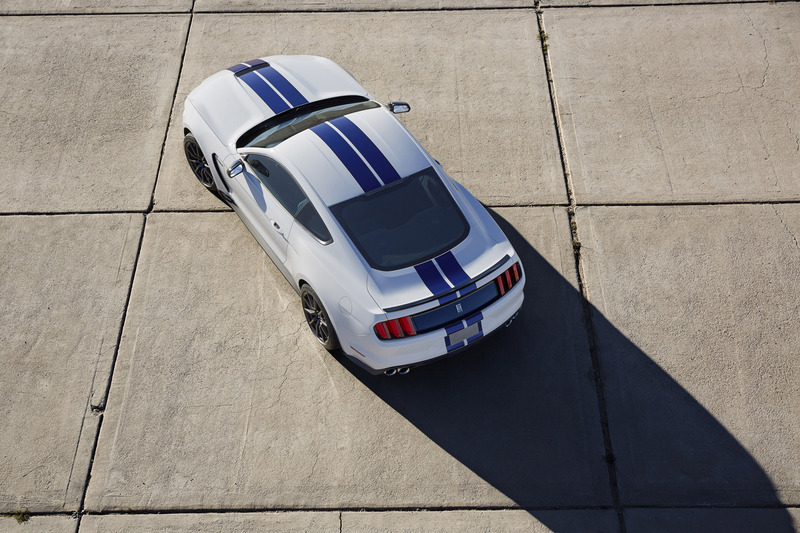 The original Shelby GT350 introduced in 1965 established Mustang's performance credentials. 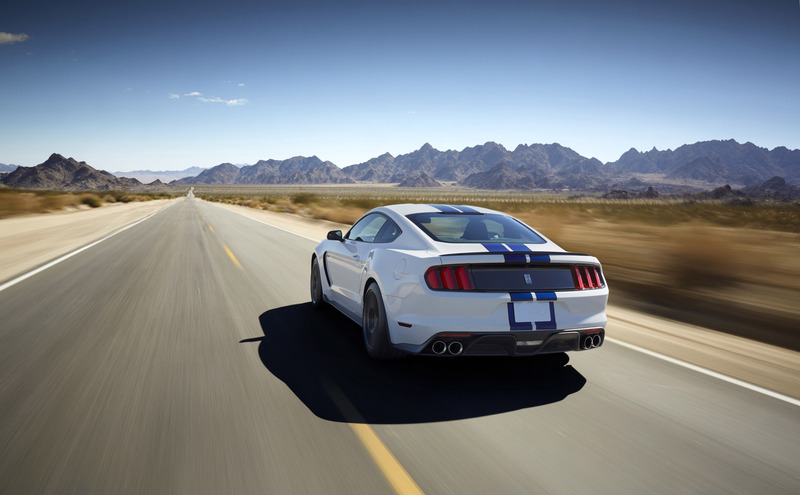 The all-new Shelby GT350 Mustang, featuring the most powerful naturally aspirated Ford production engine ever, is a world-class performance vehicle, designed to tackle the planet's most challenging roads – an all-day track car that's also street legal. 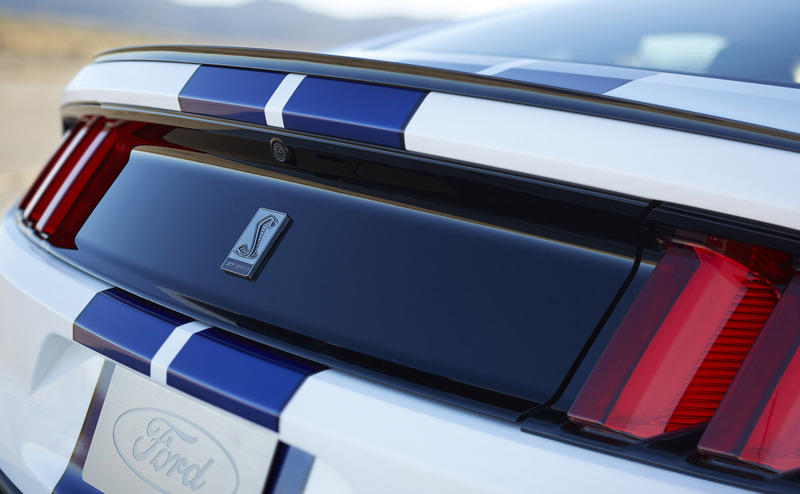 The new GT350 builds on Carroll Shelby's original idea – transforming a great every-day car into a dominant road racer – by taking advantage of a dramatically improved sixth-generation Mustang to create a truly special driving experience. 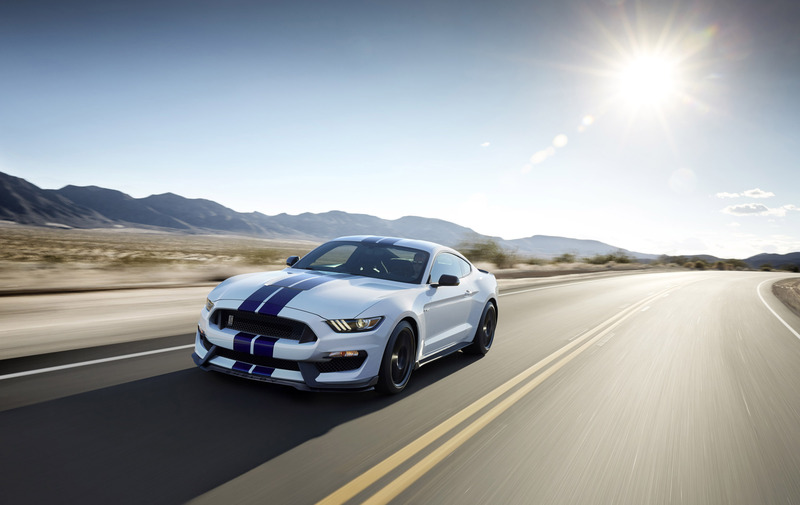 Driving enthusiasts behind the wheel of a Shelby GT350 can expect to be treated to the most balanced, nimble and exhilarating production Mustang yet. 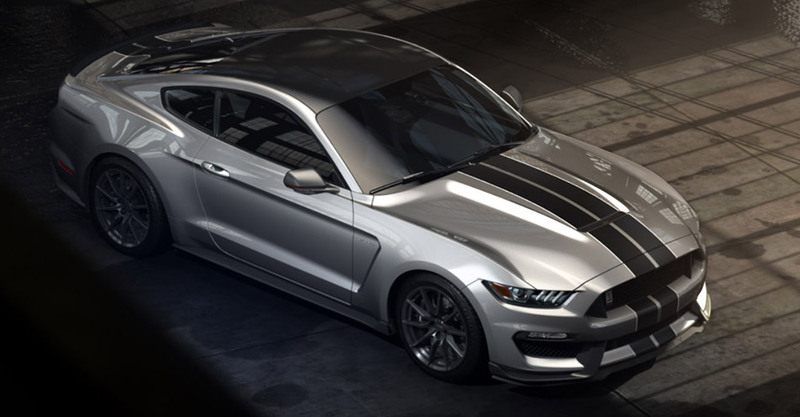 Ford engineers took an innovative approach with GT350. Rather than develop individual systems to perform well independently, every component and shape is optimized to work in concert; balance is the key. While paying rigorous attention to detail, the team pushed the envelope with cutting-edge materials and technologies. "When we started working on this car, we wanted to build the best possible Mustang for the places we most love to drive – challenging back roads with a variety of corners and elevation changes – and the track on weekends," said Raj Nair, Ford group vice president, Global Product Development. 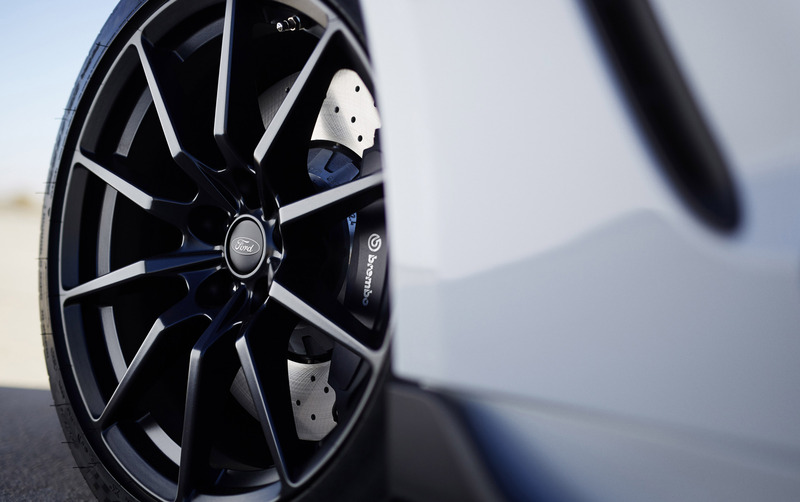 "Every change we made to this car was driven by the functional requirements of a powerful, responsive powerplant – nimble, precise handling and massive stopping power." "The final product is essentially an all-new powerplant unique to GT350 – and one that takes true advantage of the new chassis dynamics of the Mustang platform," said Jamal Hameedi, chief engineer, Ford Global Performance Vehicles. The 180-degree, flat-plane layout permits a cylinder firing order that alternates between cylinder banks, reducing the overlap of exhaust pressure pulses. When combined with cylinder-head and valvetrain advancements, this permits better cylinder breathing, further extending the performance envelope of the V8. "Make no mistake, this is an American interpretation of a flat-plane crankshaft V8, and the 5.2-liter produces a distinctive, throaty howl from its four exhaust tips," said Hameedi. For optimum handling, the wheels need to respond quickly to the contours of the road and driver input. Reducing unsprung mass is key to improving that response, but a balance must be struck between taking mass out of a suspension and delivering truly capable braking performance. GT350 makes use of extra-stiff 19-inch aluminum-alloy wheels – 10.5 inches wide in front, 11.0 inches in the rear – clad in state-of-the-art Michelin Pilot Super Sport tires with GT350-specific sidewall construction, tread face and compound. The custom tires are designed to deliver maximum grip on the road or at the track. 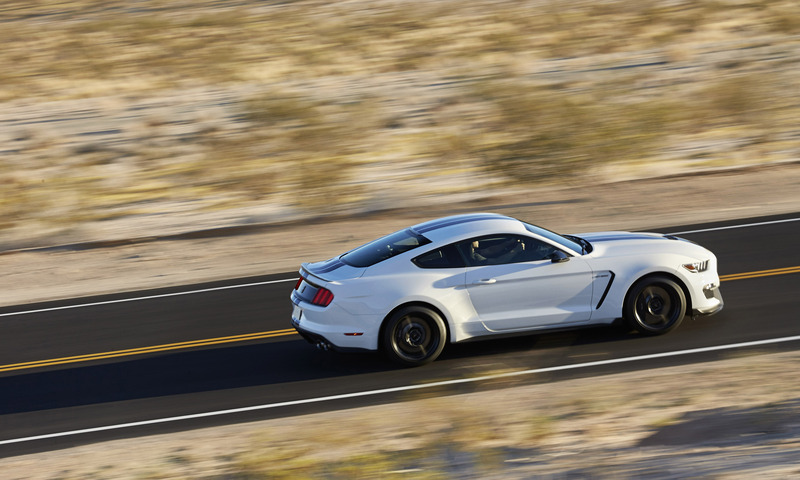 "Everything we changed on GT350 is purely functional-driven design, with the goal of improving the overall performance of the car," said Chris Svensson, Ford design director, The Americas. "We optimized the aero shape of the car, and then fine-tuned what was left to increase downforce and cooling airflow." 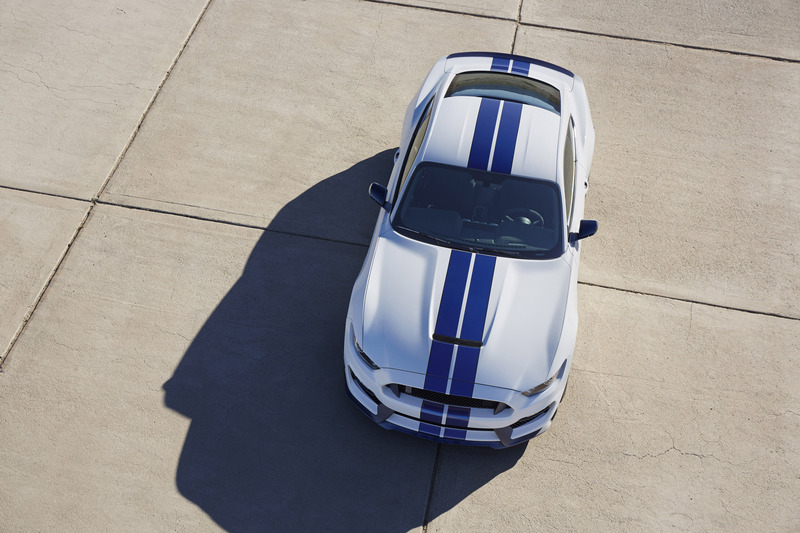 All bodywork from the windshield forward is unique to this high-performance model and up to two inches lower than Mustang GT. The new aluminum hood has been lowered and sloped, compared to the base Mustang, tightly wrapped around the engine for the smallest possible aerodynamic signature. Front and rear aero elements have been balanced to work together on the track. The fascia has been resculpted to provide the aggressive lower front splitter with maximum pressure and a ducted belly pan delivers significant downforce. The hood outlet acts as a heat extractor while also reducing underhood lift at high speed. At the rear, much of the engineering was focused on creating an aggressive functional diffuser doing double duty to increase downforce and provide cooling air to the optional differential cooler, and a subtle lip spoiler across the trailing edge of the decklid increases downforce without adding excess drag. The athletic stance of the all-new Mustang is further accentuated with recontoured aluminum front fenders to accommodate the wider front track and wider wheel arches. Front fender vents work with vented inner fenders to draw out turbulent air in the wheel wells and smoothly direct it down the side of the car. The forward-angled grille is designed with individual openings to draw air through the radiator, high-pressure engine air intake, cooling ducts for the front brakes and, optional with the Track Pack, an engine oil cooler and a transmission cooler. 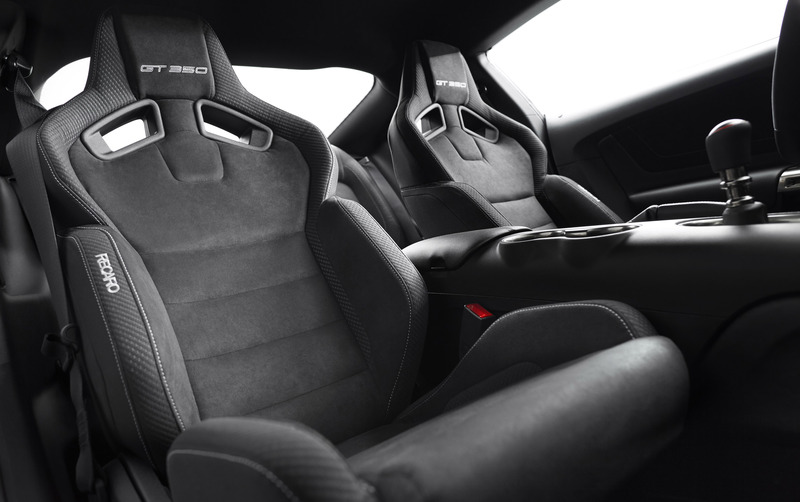 Like everything else about GT350, the interior has been optimized for driving, beginning with the specially designed Recaro sport seats with a unique cloth. Hundreds of hours and many prototypes went into a seat that is both comfortable in daily driving and capable on the track. A flat-bottom steering wheel makes it easier for the driver to get in and out, and is more ergonomic on the racetrack. Gauges are upgraded to reflect the enormous performance capability of the car. Chrome and bright finishes have been reduced or eliminated to prevent sun glare that may distract the driver. "We took the best Ford Mustang yet and massaged every aspect of the car that affects the performance driving experience," said Hameedi. "We tested endlessly on the most challenging roads and tracks in the world, and we believe serious drivers will love the Shelby GT350 Mustang."